For half a century I have maintained a close, often intimate, relationship with the Duruflé Requiem. In all that time I have been convinced that Duruflé’s first version, recorded here, suffers from being over-orchestrated. My persistent perception has been that the sheer weight of Duruflé’s scoring – using a full-sized symphony orchestra - overwhelms the essential intimacy of the music, obscures its devotional depth and all but smothers the intricate tracery of Gregorian chant which runs throughout the whole work. This recording convinces me that my long-held perceptions were wrong. The lavish and luxuriant orchestral writing, far from obscuring or overwhelming, opens up magnificent new vistas, broadens horizons and creates a sense of awe-inspiring wonder which is barely glimpsed in either of the other versions (with chamber orchestra and organ, and with organ alone). This revelatory interpretation of what is one of the most popular Requiems in the repertory, is brought about by Ivan Repušić’s exquisite timing, inspired approach to inner balance and visionary comprehension of the music’s architectural scope. He brings an epic intensity to the climaxes (and an almost unbearable ecstasy to the “Hosanna” of the Sanctus), coaxes a marvellously sumptuous tone from his singers – positively ravishing in Lux Aeterna - and draws from this vast orchestral palette individual instrumental colours which help give a sense of perspective. The choral singing from the Munich Radio Choir is magnificent, their dynamic and expressive range every bit the equal of the orchestra’s, and their diction natural and unfussy; we experience the text as if it is woven into the fabric of the music rather than superimposed on to it. The two soloists achieve something which is rare in recordings of this large-scale version of the Requiem – they inject drama, passion and intensity into their solos without ever sounding operatic or crossing over into the realms of melodrama. Baritone Ljubomir Puškarić has huge potency in his beautifully measured “Hostias” and almost frightening fervency in his “Tremens factus sum ego”, which in itself lights the fuse for an exceptionally intense Dies Irae - a moment at which Repušić pulls no punches and with thundering drums evokes, not Fauré (with whose Requiem the Duruflé is commonly associated) but Verdi. Mezzo–soprano Okka van der Damerau, through effectively measuring her vibrato, moves between the angelic and the innocent with absolute sincerity. Recorded during live concerts in a Munich church, there is absolutely no evidence of the presence of an audience, but, sadly, a fair bit of evidence indicating the pressures of live performance. There are places where things just don’t quite fall into alignment, there is a momentary lapse with the choral entry at the start of the In Paradisum, and while Puškarić has a bit of a tuning wobble at his very first entry, van der Damerau’s breath support begins to give out in the very final moments of the Pie Jesu. These flaws, though, only serve to underline the absolute sincerity of the performance. That said, the brittle, often coarse sound of the orchestra – something which is not entirely down to the recording quality – is a bit of an irritant, not least in the rasping horn which adds an unfortunately grating counterpoint to the beautiful purity of the distant sopranos of the In Paradisum. The pairing of the Duruflé Requiem with Respighi’s rarely-heard violin concerto is, to put it mildly, strange. 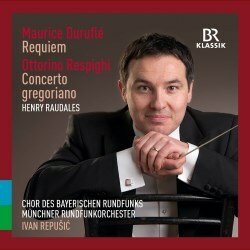 The thinking behind it seems to be that Respighi was also inspired by Gregorian chant (hence the work’s title), but apart from hints of the Dies Irae in the second movement, specific references to specific chants are – if they are present at all, which the booklet notes assure us they are – disguised beyond recognition. Indeed, if the melodic lines remind me of anything, it is British folk music; the first movement opens with the kind of long, winding line which is rather more Vaughan Williams than Pope Gregory the Great, while the third movement leads off with a jaunty figure which seems to have been lifted straight out of Bruch’s Scottish Fantasy. That feeling of a connection between Respighi’s Italian outlook and the British countryside is given tangible support by the first entry of the soloist who, over shimmering strings and a rustic oboe cantilena, soars high above in the style of an ascending Gloucestershire lark. If the Gregorian chant is, in Respighi’s view, an allegory for the mystical, evocative past, this performance peremptorily brushes such romantic visions aside. For while there is beauty at the outset, that is soon lost as Henry Raudales’s hard-edged and steely violin tone relentlessly pushes out Respighi’s tortuously extended lines. The sound of the instrument is one thing, but while Raudales is unquestionably a player of great skill and one for whom virtuosity is as natural as breathing, he is too rigid, inflexible and strait-laced to adapt his technical prowess to meet Respighi’s musical images. The high point is the first movement cadenza where Raudales presents playing of amazing technical fluency. Elsewhere, what is missing here is warmth, convincing expression or real sensitivity. As with the Duruflé, the orchestral sound is all rather harsh and brittle, but here, in music where orchestral colour and effect is the primary focus, this is an issue which seriously undermines the performance as a whole. We read in the booklet notes that Respighi “waited in vain throughout his life for a performance that would do the piece justice”. Sadly, having experienced this one on disc, I fear he is still posthumously waiting.